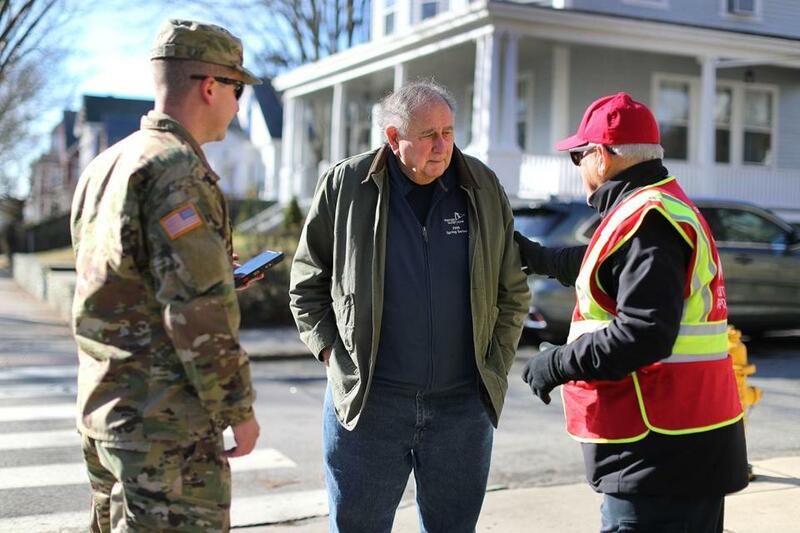 National Guardsman Jacob Tucker and disaster-response team member Walt Maize checked the well-being of resident Stewart Abramson. 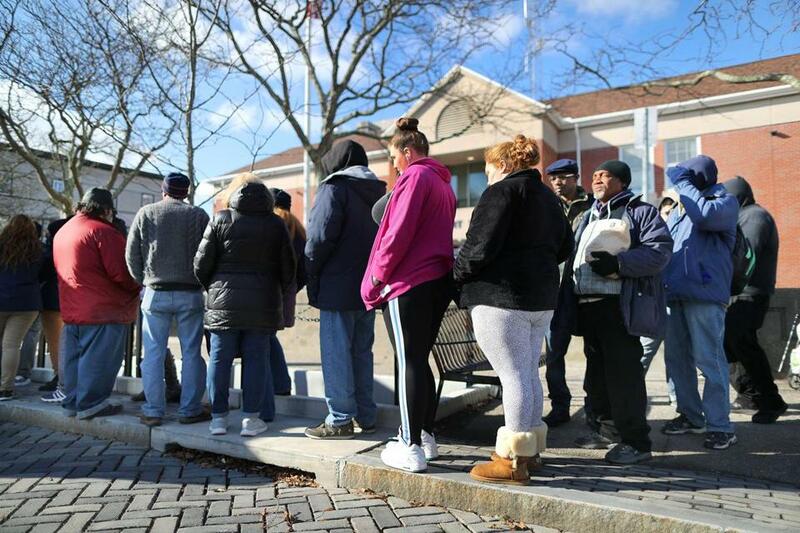 NEWPORT, R.I. — Thousands of residents without heat and hot water in the middle of winter, queuing for free meals, food vouchers, and space heaters. Displaced families in temporary lodgings while National Guard troops and construction crews secure homes one by one against the threat of explosion. Shops and restaurants forced to close, a week of business lost. In an eerie reprise of the Lawrence disaster, but without the loss of life and catastrophic loss of property, another New England community has been held hostage this week to a prolonged breakdown in the natural gas system. Some 6,500 residences and businesses in Newport lost gas service Monday evening — a day when temperatures topped out at just 11 degrees — and may not get heat and hot water back until Wednesday, state and utility officials said Friday. Hundreds of utility workers have been going house to house, shutting off gas meters one by one to prevent explosions from a rush of gas when they bring the system back online. The triggering event for the Rhode Island outage may trace back to Massachusetts. The gas utility, National Grid, has attributed the cause to a valve malfunction at a compressor station in Weymouth Monday that caused pressure in the gas distribution network to drop. Under that low-pressure situation, Newport — some 50 miles away at the end of the system — lost gas service. Newport residents lined up at a food truck for free meals. 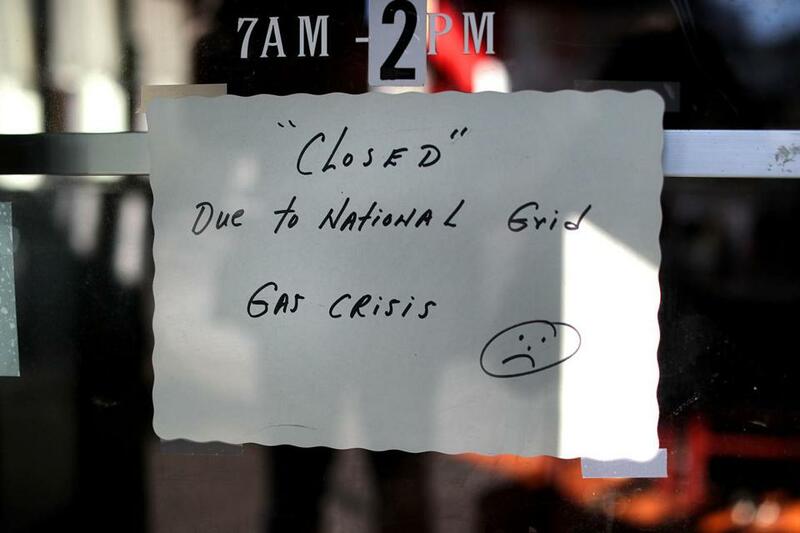 Industry experts said the Newport outage exposes potential weaknesses in the natural gas system, and raises concerns about the safety and reliability of a service millions of New Englanders rely on to heat their homes and cook meals. 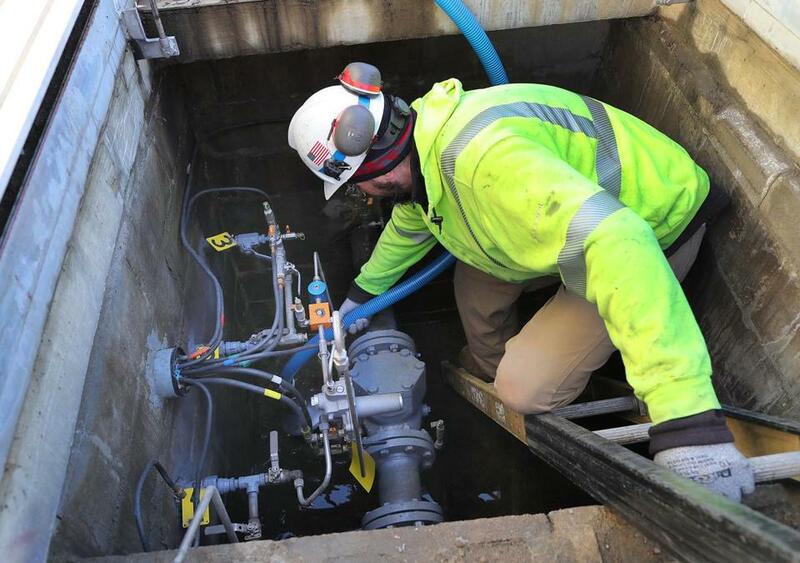 “The real sad part is we’re relying on this gas system that has so many single point failures, and when one thing fails, it takes so long to turn things back on,” said Bob Ackley, a gas leak specialist with Gas Safety USA of Southborough. National Grid has deployed about 1,000 utility workers to visit each property and close off the gas meter, using locksmiths to get into the many empty vacation homes in this popular summer destination. The utility expects to complete repressurizing this weekend, and then will retrace its steps at each property, reopening every gas meter and relighting every appliance. Frustrated residents sounded stoic. Despite its famous seaside mansions and reputation as a wealthy summer enclave, Newport is home to many year-round working-class residents. Kelly Ferro, a 39-year-old who works for Sailing World Magazine, is staying with friends and worried about her pipes freezing. “I’m definitely ready for it to be over, or at least get a better sense of when it’s going to be fixed,” she said, while waiting in line for grocery vouchers. On Friday, Governor Gina Raimondo of Rhode Island said state and federal energy officials are investigating. “This is a huge emergency. We’ve never seen anything like this,” she said. National Grid worker Jesus Garcia investigated valves at a gas substation. The Merrimack Valley disaster remains under investigation by federal and state officials. The Massachusetts Department of Public Utilities said it is not investigating the cause of the Newport outage because the facility in Weymouth is part of the interstate gas system and under federal jurisdiction. But the DPU, which has hired a consultant to conduct a safety review of the gas industry in Massachusetts, has sent officials to Rhode Island to assist with the response. And Governor Charlie Baker this week authorized the Massachusetts Emergency Management Agency to send workers to Newport to help. The Newport and Massachusetts incidents are similar in scale; in Merrimack Valley, some 8,000 customers lost gas service. But there are big differences. The Lawrence area crisis was triggered by the opposite problem: overpressurization in the local gas system. The damage from dozens of fires and explosions was extensive, and an 18-year-old man died when a chimney collapsed onto him. Residents were without gas for about three months as crews dug up streets to replace miles of pipes. By contrast, in Newport, no injuries or significant damage — beyond frozen water pipes — have been reported, and officials expect the outage to be considerably shorter. Raimondo on Friday said the restoration was about halfway done and urged residents to not relight their appliances, saying that the work can only be safely performed by qualified technicians. The Enbridge connection has outraged residents in Weymouth who oppose the company’s plan to build a new natural gas compressor station in the town, citing impacts on health and property values. Richard Kuprewicz, a pipeline safety specialist and adviser to the federal Pipeline and Hazardous Materials Safety Administration, said it’s unusual for a low-pressure problem to cause such a widespread outage. He questioned whether the utilities have enough pressure-monitoring equipment and backup systems, and if they reacted quickly enough. A lack of natural gas service has shuttered the Hungry Monkey restaurant on Broadway in Newport. Michael Levenson can be reached at mlevenson@globe.com. Matt Rocheleau can be reached at matthew.rocheleau@globe.com.